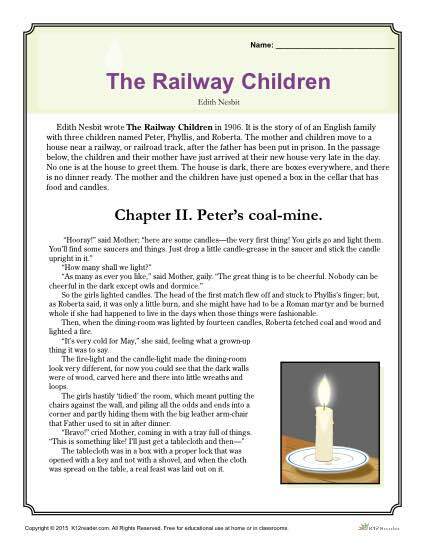 Edith Nesbit wrote The Railway Children in 1906. It is the story of of an English family with three children named Peter, Phyllis, and Roberta. The mother and children move to a house near a railway, or railroad track, after the father has been put in prison. In this passage, the children and their mother have just arrived at their new house very late in the day. No one is at the house to greet them. The house is dark, there are boxes everywhere, and there is no dinner ready. The mother and the children have just opened a box in the cellar that has food and candles. Students read the passage, and then complete the 5 worksheets focused on comprehension, vocabulary and more. Ideal for 3rd grade but can be used as appropriate.